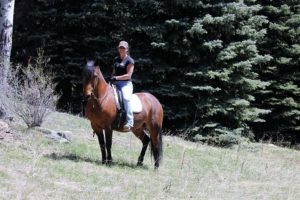 If you have been around our mountain horse community a while, you have heard of Kristie Cotton. 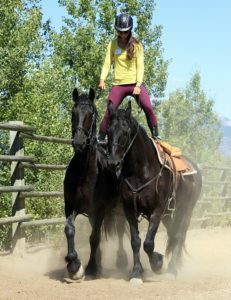 Kristie grew up in the Evergreen and Conifer areas, spending her days exploring the mountains by horseback. 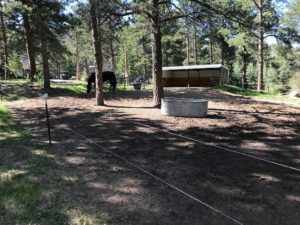 “When you are young and in the woods on a horse, you learn very quickly how important the understanding of taking care of each other is in any situation.” Kristie’s love for the horse turned into her lifetime career and quest to learn and improve the lives horses and their people through training and understanding. As a young kid, Kristie quickly realized she wanted to be a horse trainer. She started taking lessons when she was 9 from a woman who lived on Shadow Mountain. In the beginning, she was not allowed to have the reins or a saddle until she had an *independent seat, learning the importance of strength and balance in riding. To feed her quest for knowledge of all things horse, Kristie found work at local barns in trade for learning everything she could. She rode horses for neighbors who were afraid to, plus there were several horse breeding farms in our area at the time which gave her work teaching the colts to tie, lead and pick up their feet. Years later, Kristie continues to train horses, and their people in our community. 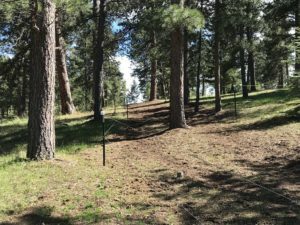 Most of her time is spent working on private ranches keeping the horses trained and safe on trails for the owners and their guests. 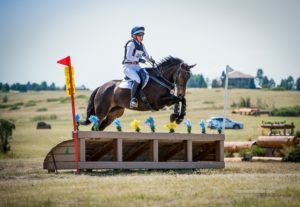 Kristie states, “if the horse is confident in its training, then it can be ridden anywhere. 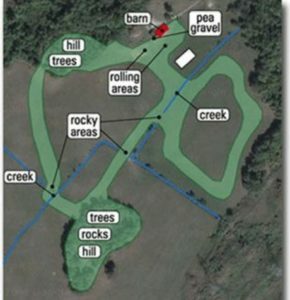 Trail riding becomes a partnership of trust and willingness.” She also starts young horses with a strong, lifetime foundation, as well as specializes in behavioral issues and has re-educated horses with unpredictable behaviors such as spooking, bucking, and rearing. Kristie is a true advocate for the horse and the important role that they can hold in the lives of people. Kristie was just nominated as the publications chair for Working Equitation United States. 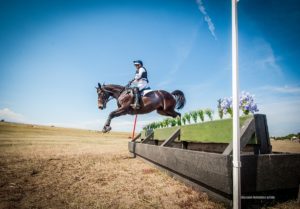 Working Equitation combines the focus of Dressage with the creative use of training obstacles helping to keep training interesting for horses and riders of any discipline or breed of horse. See weunited.us for more information. As with children and other animals, horses cannot “tell” us what is bothering or hurting them. All we can do is watch and listen to what their body language is telling us. Through trial and error and sometimes exhaustive medical treatments, alternative therapies and natural remedies, we come to the end of our own resources and knowledge. We listen to the advice of professionals, experts, others who may have had similar experiences. We “throw the pharmacy at them” to see if something, anything will make even a small change, or help diagnose what it’s not. 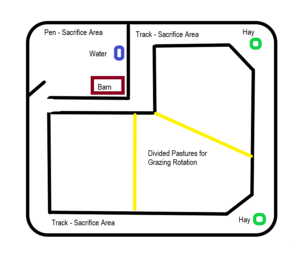 But with horses, unpredictable physical behavior is dangerous, often leaving us with only one reasonable option. 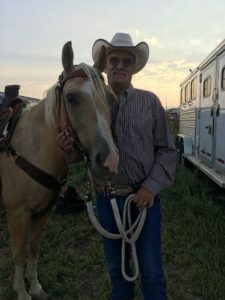 This is the story of retired lawyer and local horsewoman, Deborah Carter, who would not give up on her beautiful 3 year-old Quarter Horse filly, Star. On August 16th, 2017, Deborah Carter picked up Star from 3 months of training as a cutting prospect. Star had some retained baby tooth caps that needed to be removed as well as a cough, runny nose and a mild lameness. 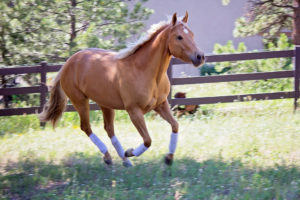 After a trip to Littleton Equine Medical Center, a new set of shoes and a couple weeks at home, Star was back in great shape. Two weeks later, at morning feeding time, Star started frantically leaping, bucking and twitching in her stall. After Deborah pulled off the fly sheet, Star began to settle down. That same day, another horse in the barn was covered in hives. After discovering and removing a nearby wasp nest, and some frantic internet research, Deborah suspected that wasp sting venom might be to blame for the behavior and the hives. Star had some time to recoup and then resumed her groundwork, lunging and riding. Her first day with a rider, she started violently spasming, whirling around, leaping, and was clearly terrified. With the rider and tack removed, she continued to spasm and twitch in her stall for hours. Upon consultation with her vets, and discussion of the possibility of the neurotoxicity of wasp venom, Deborah gave Star IV Dexamethasone and added Vitamin E and magnesium to her diet. Over time and with only turnout and no forced work, Star appeared to be improving. However, Deborah quickly discovered that even a mere touch at the base of her neck or withers could trigger the hyperactive neuromuscular response. Star understandably was becoming quite suspicious and defensive. This once trusting and affectionate mare, was not able to control or overcome this condition. A team of vets led by Dr. Erin Contino of Colorado State University’s Equine Orthopaedic Research Center Vet came to Deborah’s Silvertip Farms for further evaluation and diagnosis of the cause of Star’s puzzling symptoms. Star exhibited the same behavior Deborah had been observing, even when the veterinarian would merely point in the general direction of her withers or neck without contact. A brief lameness and neurologic exam was performed, bloodwork, X-rays of Star’s cervical spine and withers, all with unremarkable results. The plan was to commence a course of the nerve pain medication and anticonvulsant, gabapentin, and then a trial of corticosteroids if the gabapentin did not work. All treatments were completed with no success. CSU returned for further evaluation and to test Deborah’s latest theory that perhaps pelvic pain was the culprit. A reproductive exam revealed no significant findings other than that Star was in heat. The new plan: administration of the hormone, Regumate, to suppress Star’s heat cycles as well as Reserpine, a long acting sedative, to see if that might make a difference. Leaving no stone unturned, Dr. Contino recommended the “complementary” medicine options of chiropractic evaluation and adjustment as well as acupuncture, where a liquid, typically Vitamin B-12, is injected into acupuncture trigger points in order to gain a longer term effect Through all of the different medications, supplements, hormone treatments, techniques, not to mention concoctions of herbal supplements, Star’s condition remained the same. Star had become defensive and dangerous in her stall. Deborah was thinking that her only option may be to euthanize this stunning young mare, but she continued to search for a way to help her. “I learned of the experimental use of Botox in treating laminits in horses, and thought maybe blocking signals from the nerves to the muscles might help, but ultimately agreed with Dr. Contino that Star’s fasciculations had become too dispersed to even know where to inject. And then I discovered CBD.” Deborah came across credible stories of Cannabinoid or “CBD”, the non-psychoactive extract of the cannabis plant,and its effectiveness in treating anxiety, inflammation, and pain. 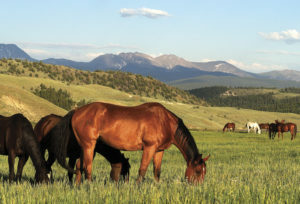 Since the other alternative was euthanasia, the vets were supportive but not familiar with the use of CBD in horses or the appropriate dosages or delivery. Friends and colleagues had some experience with CBD dog treats for their pups’ separation anxiety, but were of little help when it came to CBD for horses. So Deborah set about to blaze her own trail. Due to federal regulations, there exists little scientific research in the use and efficacy of CBD. But reports of experiential results abound. With increased knowledge and a supply of pure CBD extract from a top Colorado extraction company, Deborah designed a treatment plan for Star. After literally one day of a fairly high dose of CBD Star was almost symptom free. Next day, next dose, the same. Over the last year, Star has continued to improve on an ever-reducing dosage of CBD. Not long after Stars dramatic turn for the better, Deborah and her enterprising son Sam began their own trials of CBD in horses, dogs, cats and people, an undertaking that led them, with consultation from lawyers, financial advisors, Ph.D. chemists, and others to launch Trove LLC, their own CBD company with the highest quality CBD products for people and animals (www.TroveCBD.com). Amazingly, through our evolutionary development, mammals (including humans, horses, dogs and cats) have been hardwired to gain the benefits of the cannabis sativa plant through our endocannabinoid system (ECS). The ECS is a complex signaling network within the mammalian body that functions as a lock and key mechanism when cannabinoids are introduced into the bloodstream. These receptors are present throughout the body, and are the reason why cannabinoids can have such diverse and profound effects. With the recent research, development, and experience, CBD has made a name for itself as a natural means of supporting the immune, musculoskeletal, digestive, and nervous systems. CBD is also non-psychoactive,non habit-forming, and well tolerated. Deborah’s tenacious desire and desperation to save Star led her down new paths and opened up a treasure trove of a new kind of therapy. Star continues to improve, and Deborah hopes that she can eventually return to her under saddle work. But if not, Star is beautiful, happy, pain-free and alive. Check out TroveCBD.com for more information on CBD and the full line of Trove products for people, horses, dogs and cats.